According to a dictionary definition, a leader is a person who leads or commands a group or an organization. Did you know as early as children and teenagers acquire qualities of a leader? The past few years there is an emphasis on how effective this leadership role is on a student in a school environment. However, this valuable opportunity can extend farther than just the classroom. Students in leadership roles benefit just as equally in the dojo! Students involved in martial arts already have a major advantage in acquiring skills for life due to their martial arts training. But by being put into a leadership position they can bring their skill set to the next level. Students can take on leadership roles that go far beyond helping their owner track attendance or manage prospects. We are sharing 3 ways in which martial arts students can grow by being put into leadership roles. Often, the best way to learn and fully understand something is to be able to able to teach it to someone else. This type of hands-on experience is what instills skills in a way nothing else can. 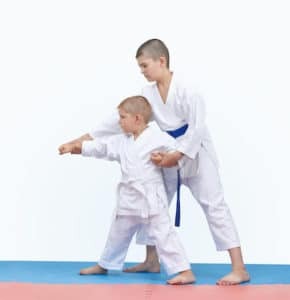 Martial arts students are already learning so many things, but when an older and more advanced student is able to demonstrate a move to the class or even be an assistant to their karate teacher, they not only set an example for other students, but acquire many skills for themselves.This is a perfect example of leadership. You are not able to directly teach leadership abilities, but rather the student must experience first-hand. By being a leader, students are able to experience a completely different kind of learning. By being in charge and holding responsibility, students learn how to manage groups, organize projects, solve problems, and be independent. Being in charge of a group or project, a student learns how to rely on themselves and their own abilities, instead of someone else. This dramatically increases maturity and creates a healthy competitive nature which is vital in a strong leader. Leadership is a quality that is necessary in the real world when one finally enters the workforce. Students having this experience in leading others and being in charge, students are better prepared for real world work experiences in college and future jobs. Leadership experience is also effective in increasing student’s self confidence. Confidence is truly the foundation of a leader. In order to successfully lead, one must believe in themselves and what they are capable of. When put into a leadership role, a student will quickly realize that in order to make others believe them and follow their lead, they must first believe in themselves. It is much easier to trust someone who exudes confidence in what they are saying and doing. By becoming a leader, a student will grow into this concept more and more.